Thursday, 25 January 2018: On average, mammals move distances two to three times shorter in human-modified landscapes than they do in the wild. Elephants are no exception. These findings have been published today by an international team in the journal Science. It is the first time this topic has been examined at a global scale and for many different species at once. The authors highlight that these results may have far reaching consequences for ecosystems and in turn, for society. Most mammals are on the move every day while searching for food, to find a mate or to seek out shelter. Some larger mammals like zebra generally move longer distances, while smaller mammals, such as hares, usually cover shorter distances. A team led by biologist Dr. Marlee Tucker, Senckenberg Biodiversity and Climate Research Centre and Goethe University Frankfurt, has shown that the extent of these movements is significantly reduced in human-modified areas. In these areas, mammals move distances that are only half to one third of what they cover in more natural areas. "As the human footprint rapidly expands across Africa elephants are getting pushed into ever-smaller spaces," said Iain Douglas-Hamilton, founder of Save the Elephants and a co-author on the paper. "This constriction also affects 56 other mammals. We still have a short window in which we can define important wildlife corridors through the intensive tracking of elephants. 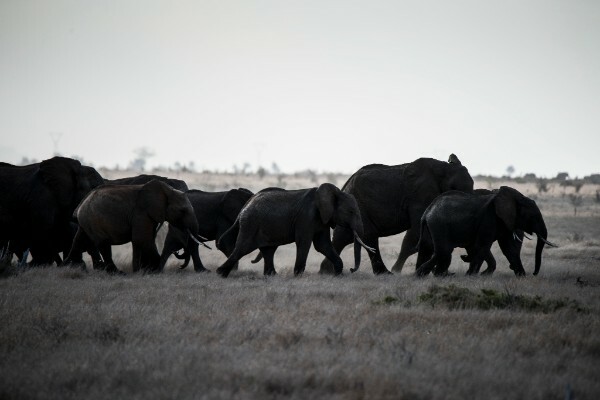 If these are defended now they can save a vital part of the shrinking connectivity, not only for elephants, but for all wildlife." In this study, Tucker and 114 coauthors from various institutions collated movement data from 803 individuals across 57 mammal species from around the globe. To do this they used the data portal, Movebank, which archives movement data from researchers across the world. “Our study looks at everything from hares to wild boars to elephants. The scientists in our team equipped individual animals with a GPS tracking device that recorded each animal’s location every hour for a period of at least two months,” said Tucker. The researchers then compared these data to the Human Footprint Index of the areas that the animals were moving. The index measures how much an area has been changed by human activities such as infrastructure, settlements or agriculture. During a period of 10 days mammals only cover half to one third of the distance in areas with a comparatively high human footprint, such as a typical German agricultural landscape, compared to mammals living in more natural landscapes. This is the case for the maximum distance covered within a 10-day time frame as well as for the average distance. The analysis shows however, that at shorter time scales than 10 days, such as one hour, mammals do not move any differently across landscapes of varying human footprint. This means that the human footprint affects the ranging behavior of mammals over longer time frames, but does not affect their movements at shorter time frames. Potentially mammals move less because they have changed their behaviour in human-modified landscapes. “In some of these areas there might be more food available so that animals do not need to cover such large distances. In addition, landscape fragmentation and barriers created by infrastructure might limit mammalian movements,” says coauthor Dr. Thomas Mueller, Senckenberg Biodiversity and Climate Research Centre and Goethe University Frankfurt. The researchers are concerned that the reduced travel distances could affect ecosystem functions that hinge on animal movements. “It is important that animals move, because in moving they carry out important ecological functions like transporting nutrients and seeds between different areas. Additionally, mammalian movements bring different species together and thus allow for interactions in food webs that might otherwise not occur. If mammals move less this could alter any of these ecosystem functions,” says Tucker. Save The Elephants works to secure a future for elephants in Africa. Specializing in elephant research, STE provides scientific insights into elephant behaviour, intelligence, and long-distance movements and applies them to the challenges of elephant survival. To battle the current surge in ivory poaching, our Elephant Crisis Fund is identifying and supporting the most effective partners in Africa and in the ivory consuming nations to stop poaching, thwart illegal traffickers and end demand for blood-stained ivory.